Based on sales ranking within Amazon as of December 2, 2016, this list represents the top 5 mixers as ranked by Amazon based on sales volume. We encourage you to click through and read more information about their capabilities, pricing, and both the top positive and negative reviews. 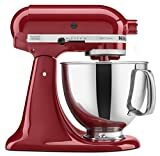 Note that for KitchenAid mixers, you may also want to do a quick review of our comprehensive mixer comparison where we look at 20+ KitchenAid mixer models. We do a quick review on each one so you can narrow your search down based on cooking needs, quality, price, etc. Some of the Hamilton Beach mixers also made it on to our review of stand mixers under $100 which you can find here. Happy shopping, and we hope whichever mixer you decide is right for you that you enjoy it for years to come! This honor goes to the KitchenAid KL26M1XER Professional 6-Qt Bowl-Lift Stand Mixer. Apparently Empire Red remains the top color choice among most shoppers! KitchenAid manages to capture both the #1 and #2 spots this month for best selling stand mixers. Not surprising given they are one of the most popular brands on the market! This month the number two seller is the KitchenAid KSM150PSER Artisan Tilt-Head Stand Mixer. Again the most popular color appears to be Empire Red, but you can also check out over 20 other colors available on this specific model. We finally have a brief break from KitchenAid! Hamilton Beach sneaks in here with their cheapest stand mixer which may be sufficient for the casual, light baker. You will want to read our more in-depth review of this mixer before deciding if it is right for you. We only ranked it 3 stars due to several concerns, but given the price point and the amazing volume of Amazon reviews around the 4 star mark, you may decide you can live with it. KitchenAid roars back into the top 7 with their Classic 250-Watt 4.5Qt Tilt-Head stand mixer. 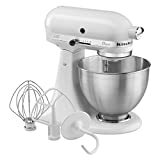 In the number 4 selling position on Amazon for kitchen mixers, this is an economically priced mixer that has been around for quite a while. At 250 watts it is not the most powerful stand mixer, and in fact is comparable to make hand mixers. A stainless steel bowl, strong track record of reliability, and decent capacity make this a good choice for the casual baker. As mentioned in our comprehensive comparison of KitchenAid models, this would not be the best choice for making larger batches of bread dough or cookies. If you are a serious bread baker you should check out our thoughts on the best mixer for dough. KitchenAid remains in the mix at number five for December. The Professional 5 Plus 5-Quart bowl lift stand mixer is actually a discontinued model from KitchenAid, but continues to sell well. Again this position in the ranking is for the Empire Red color which is not surprising at this point.